In the early 1980s, China undertook a massive reform that dismantled its socialist rural collectives and divided the land among millions of small peasant families. Known as the decollectivization campaign, it is one of the most significant reforms in China’s transition to a market economy. This mainstream history argues that the rural communes, suffering from inefficiency, greatly improved agricultural productivity under the decollectivization reform. It also describes how the peasants, due to their dissatisfaction with the rural regime, spontaneously organized and collectively dismantled the collective system. A closer examination suggests a much different and more nuanced story. Zhun Xu argues that the decollectivization campaign was neither a bottom-up, spontaneous peasant movement, nor necessarily efficiency-improving. Decollectivization, by depoliticizing the peasantry and freeing rural labor to compete with the urban workers, served as both the political and economic basis for consequent Chinese neoliberal reforms and a massive increase in all forms of economic, political, and social inequality. Zhun Xu is Assistant Professor of Economics at Howard University. His research interests include political economy, social development, and the Chinese economy. His recent publications appear in American Journal of Public Health, Journal of Agrarian Change, World Development, and Review of Radical Political Economics. 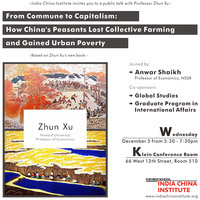 His book From Commune to Capitalism: How China’s Peasants Lost Collective Farming and Gained Urban Poverty, was recently published by Monthly Review Press.